Imagine yourself in the French countryside in a little stone house, built when people wore four layers of clothing as standard and heating was limited to an open fire. Then go outside and realise that it’s minus 14 degrees and the water has frozen in the pipes. Fun, fun, fun! You might almost be in a situation out of the “Worst Case Scenario Survival Handbook”. And yet, this is what we may well be faced with once we live in Bournac full-time. Last year, the winter was exceptionally hard. We were only there for a few days and missed the worst of the weather, but we heard horror stories of people suffering tens of thousands of euros of water damage and that others had burnt their way through €10,000 of heating oil. Husband Johnny is from tough Irish farming stock – his grandmother cooked over an open fire until the 1960s, fuelled by peat that had been cut by hand – so he knows a thing or two about keeping warm. He had been adamant that, if we wanted to be truly self-sufficient, we would need to solve the fuel problem from the start. Freedom from fossil fuel has always been our goal and, since Bournac is in the middle of a Hundred Acre Wood, the obvious decision was to copy the French paysans and burn firewood. You have already heard about the amazing Godin range that now squats in our kitchen, chunting away like the Flying Scotsman on a full belly. We have also installed a little stove in the bedroom and have another two ready for the downstairs living area and the second bedroom (once Monsieur P gets around to finishing them). But obviously they need to be fed, particularly the Godin which gobbles up a good 6-8 logs an evening. …this turned into a marvellous excuse to buy all kinds of rusty cutting implements from car boot sales and junk shops. Imagine my delight when he came home with a 4-foot-long, double-end saw (and just who did he think would be on the other end from him?) which then lurched about in the garden shed, looking for an opportunity to fall on me and make its presence felt. I lost count of the times I had to sign for ludicrously heavy parcels which a panting delivery person had lugged up the front steps of our London house. These contained all manner of mallets, chisels and wedges for splitting the logs once John had felled a tree. 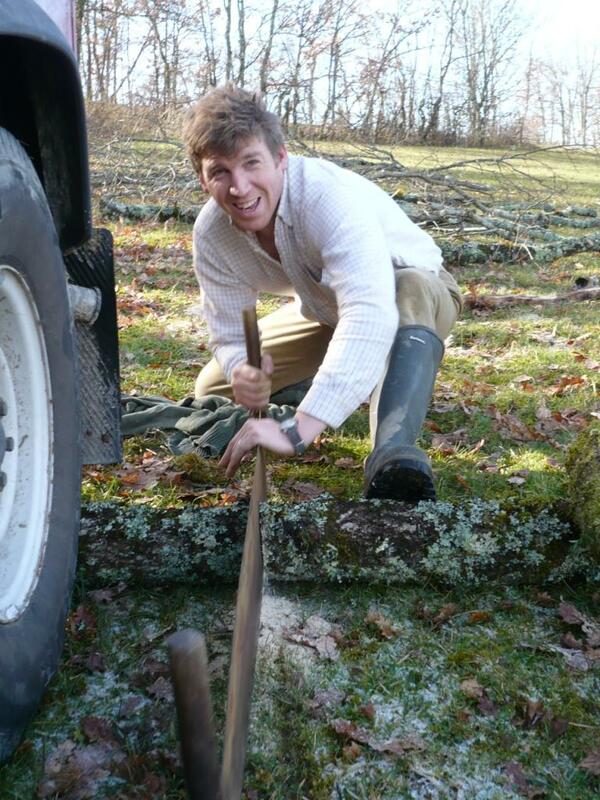 To practise his wood-splitting skills, John took to loading the Landy with wood that he found on building sites and making friends with tree surgeons who are only too pleased to get rid of large pieces of tree trunk. Soon the back of our garden in London was piled high with logs. Fortunately, we also have an open fire here so getting rid of them wasn’t a problem. Then came the grand opening of the double-ended saw. John disappeared in the Landy to drive to the top of our field in Bournac. After an hour or so, I thought I’d better check that he hadn’t done himself and injury and – yes, you guessed it – found myself on the other end of the saw (as I think he had planned all along). And what fun it was! The teeth cut through the wood like the proverbial hot knife through butter and I felt fully justified in scoffing a massive cake that afternoon as a reward. It was also really satisfying to work together as a team and to cut the wood together in less than half the time it would have taken Johnny on his own. I’ll blog more on how John has organised his wood-cutting activity because it is a free and sustainable source of fuel and you don’t need your own personal forest to provide the wood. But now, I’m going to light the fire in the sitting room here in London because my fingers are frozen from typing this and it’s not going to cost me a penny! 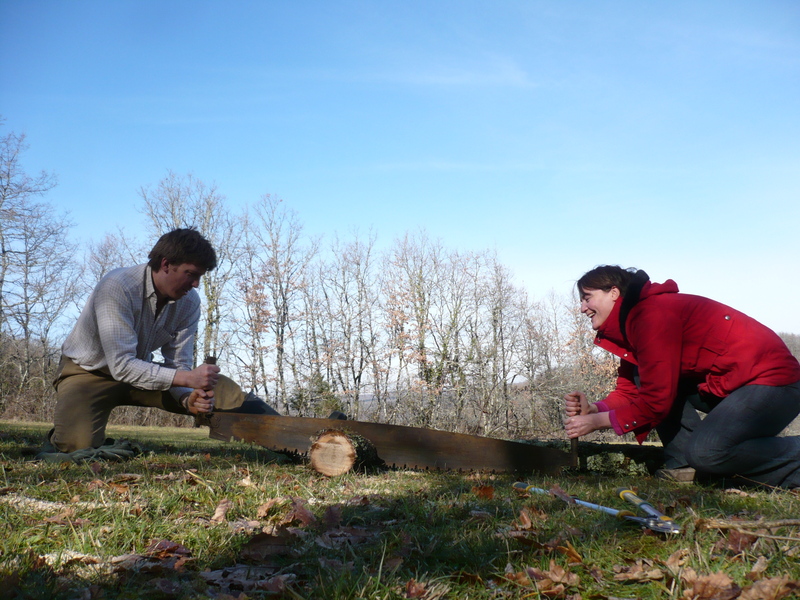 Categories: Fuel, Homesteading, Permaculture, Self-sufficiency, Wood cutting | Tags: coppicing, firewood, forest garden, forest gardening, France, fuel, homesteading, Midi-Pyrénées, permaculture, self-sufficiency, sustainability, Tarn, wood burning, wood cutting | Permalink.